4WD + Trailer – Off Road Adventure for the Whole Family! 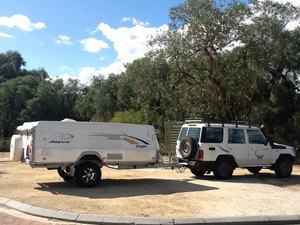 This new combo-deal let’s you hire BOTH a 4WD and camper trailer. Now the whole family can experience an Aussie 4WD holiday. 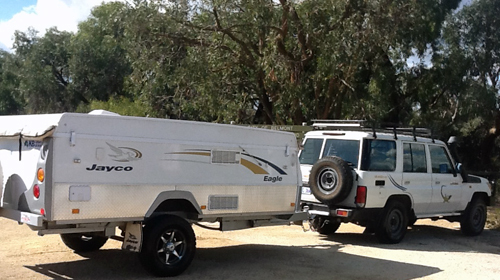 This fantastic Jayco Eagle camper trailer comfortably sleeps 6 people. It’s easy to setup and pack down. It’s also easy to tow – even if you have no experience towing a trailer. We’ll show you everything you need to know before you drive away… and everything you need is included (sleeping gear, kitchen utensils, cooking gear and more). Click this image, or click here to view details of the camper trailer hire. We supply either a Toyota Landcruiser 4.5 L Turbo diesel or Toyota Prado 3.0 Turbo Diesel. Both vehicles have 5 speed manual gearbox and seat up to 5 persons. For full vehicle specs – please contact us using the ‘Get a Quote’ button below. We will reply with available vehicles and full specifications. NOTE: Camper Trailer Sleeps 6, but 4WD only seats 5.